George and Bitty’s Quarters is one of seven houses that comprise part of the series “knot my name haint my house.” While marriage was not sanctioned between enslaved persons some people formed unions recognizing that, at any moment, their partner could be sold away without notice. My work tends to be very ornate and embellished. It was a challenge to create works that inhabit a sense of simplicity. The housing for enslaved people was varied from wooden shacks to brick buildings, although the standard abode was a poorly constructed structure that barely kept the elements at bay. For me, voting is a fundamental and cherished expression of patriotism and democracy though this right is not explicitly stated nor granted in the Constitution. Ballot BOX (produced collaboratively in a class) is a literal and symbolic representation of a right which should be available to all Americans but which is being threatened and eroded. 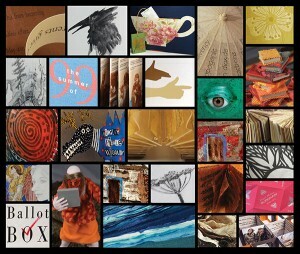 It contains a riddle and quotes from historical and literary figures. Most importantly, it includes general information on vote eligibility and registering to vote. 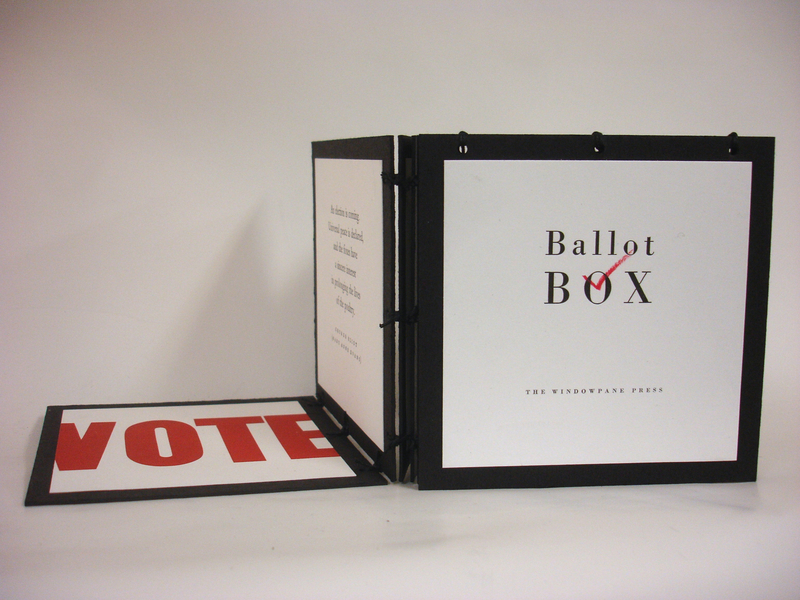 Ballot BOX is intended both to inform and inspire people to VOTE. This little book contains copies of treasured family photos of some of my direct ancestors. On the right side of the book are my great-grandmothers, grandmothers, mother and myself, and on the left are my great-grandfathers, grandfathers, father and my husband. 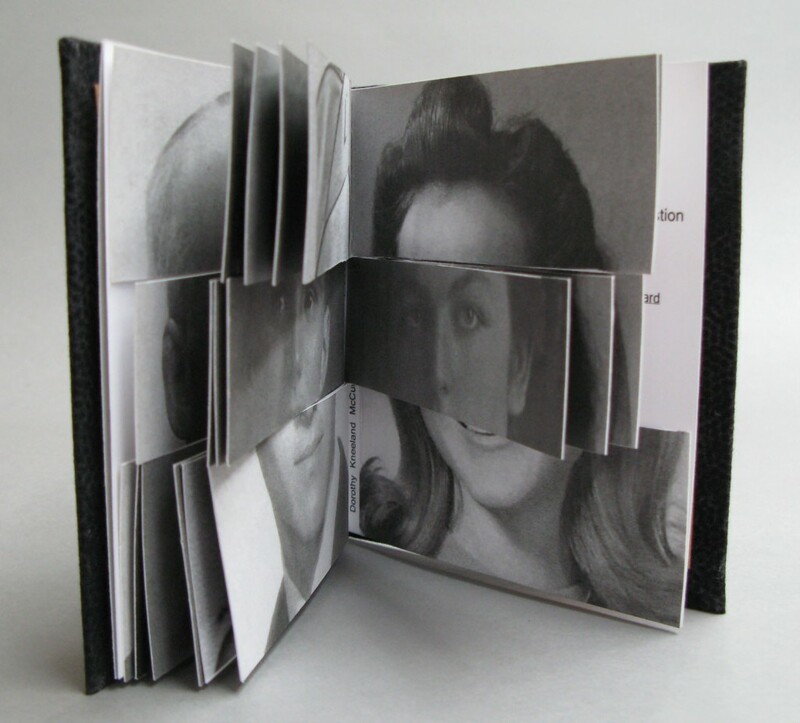 By flipping the cut pages out of order, new faces are created. Whom do I resemble? Did I inherit my paternal grandmother’s hair? My mother’s eyes? My father’s chin? The responses to these and other questions connect me to my past in a tangible way and affirm my place in the world. Congratulations to everyone who contributed work to this years’ exceptional exhibition , and congratulations especially to Lynne Knopp, Jan Ward, Taylor Cox, and Suze Woolf, this years curators, for a job well done!